I've been looking for anchovy recipes ever since receiving The Perfect Protein by Andy Sharpless, CEO of Oceana. Anchovies haven't been a regular part of my cooking, but, because I was impressed by Perfect Protein, I bought anchovies at Costco (which ended up being lots of anchovies). I've been ready, waiting for the right recipe. While reading anchovy recipes, I realized that a pot I had seen at the thrift store was a traditional bagna cauda serving pot. I hustled back to get it, if it was still there, which of course it was not. Since I didn't have the dipping pot, I needed a recipe that didn't require a separate utensil. I liked these recipes from Amateur Gourmet and the Food Network and based my recipe on those. Mix anchovies, garlic, lemon juice and olive oil. Stir over medium heat until anchovies dissolve. 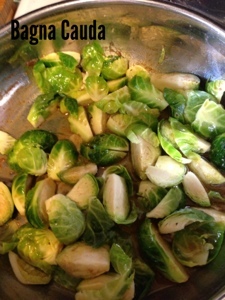 Cut Brussels sprouts in quarters, saute in bagna cauda until soft, about 20 minutes. Serve warm with warm quartered hard boiled eggs and good bread. I liked it better than Bob did. I'm definitely going to be experimenting with variations of bagna cauda, maybe for lunch when Bob's not here.